Global warming is accelerating faster than the ability for natural repair, and environmental stresses are damaging ecosystems, all affecting physical and biological systems on Earth. A new Nasa-led study shows that human activity has caused climate changes resulting in permafrost thawing, acid rain, and lower productivity in lakes as well as increased emissions of greenhouse gases, including CO2, N20, CH4, CF3, and CFC. Marine plants play a vital role in maintaining the balance of marine environments, while serving as a source of food for humankind and important chemical compounds. 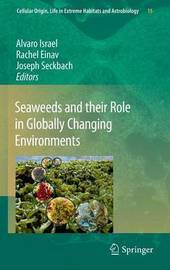 Microalgae and seaweed have enormous potential for reducing global warming and climate change. During photosynthesis algae grow, draw CO2 from the atmosphere, release oxygen, and produce solar biofuel. Experts in the life of marine plant ecosystems in globally changing environments contributed chapters to this book. The target readers are phycologists, ecologists, atmospheric scholars, conservationists, environmentalists, and ecologically aware laymen.